The Zone of Silence is located between the 26th and 28th parallels, along the 104th meridian. Its area is unknown, but has been roughly estimated as a circle with a radius of 50 kilometers, and the center is the Vertice de Trino, a point which marks the juncture of the states of Durango, Coahuila and Chihuahua (Mexico). 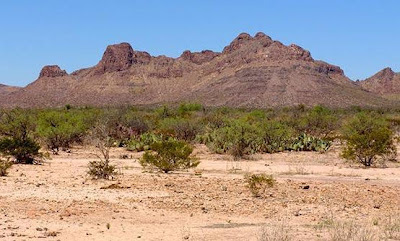 Deserts are often considered to be mysterious enough, but this particular place somewhat gobbles up radio and TV signals. In addition, other phenomenon in this territory, is the continuing fall of aeroliths, which can be found almost everywhere, as if they were attracted by a giant magnet. WHAT IS THE TRUTH BEHIND THIS ENIGMATIC AREA? Interlocutor: In Mexico there is an area called “The Zone of Silence” Is there some dimensional door in that place? Ruanel: Yes, in this area there is one. But it doesn't connect to the same planet but to a “virtual horizon”, as if it were a horizon of events and it absorbs everything and from there nothing returns. Interlocutor: Have some people been absorbed? Ruanel: Yes, but I repeat that from there nothing comes back, because it is as if it were a black hole. Interlocutor: Do you say that people who are caught by this dimensional door disembody? Ruanel: Of course, it is obvious they disembody! We are speaking of a dimensional door that connects with a gigantic gravitational well. It is as if you were suddenly submerged in a well in the center of a star. Interlocutor: Is this dimensional door easily perceptible? Ruanel: No, because it fluctuates constantly changing altitude and latitude. Interlocutor: In the physical plane Does anybody know this? Ruanel: No, nobody knows it. Interlocutor: Is that gravitational well very big? Ruanel: No, it’s not that big, around twenty or thirty meters only. What happens is that sometimes it is not at the level of the ground but at a certain altitude and then it doesn't affect those that go walking over there. It can stay a century at several meters from the surface. Interlocutor: I understand. And what function does it have? Ruanel: None. They are energy vortexes. This entry was posted at Thursday, August 20, 2009 and is filed under Science and Astronomy . You can follow any responses to this entry through the .